How about getting your spiritual level to next level; making a visit to Indian version of ‘Statue of Liberty’ without a US visa, making ‘monkey-dolls’ from the un-husked coconut by ditching the usual touring sites! This summer, my friends zeroed in on Tamil Nadu for our annual holiday break. Tamil Nadu tourism is strongly promoting the ‘Temples’ of the state apart from beaches, heritage, adventure and culture. The state has more than 33,000 temples, many at least 800-1200 years old!. Considering its reputation as ‘temple state of India’, I was least interested as I thought the state won’t offer anything more than a dozen temples sites. I was totally taken aback and proved wrong when I landed in Chennai and headed for a week-long vacation in this mesmerizing state of ‘Incredible India’. Exotic beaches, historical temples, exciting wildlife reserves and preserved cultural heritage makes it a ‘must-see’ state in India. Since it’s impossible to write about the beauty of the entire state (which is a country in itself), let’s fasten our seatbelt and head to this beautiful state for some lifetime experiences. Ofcourse we visited the temples in this temple state! Thousands of temples with lofty towers dot the corners of Tamil Nadu. The popular ones are Shree Meenakshi Sundareswarar Temple (Madurai) and Brihadisvara Temple (Thanjavur) famous for its architecture. Every month during Full Moon Day thousands of devotees visit the Arulmigu Arunachaleswarar Temple (Thiruvannamalai). We also had option to visit the Arulmigu Sarangapani Temple (Kumbakonam) which is one of the oldest temples dating back in ninth century and Kanchi Kamakshi Amman Temple (Kancheepuram) popular for its ruins and beautiful sculptures. Skipping the famous Meenakshi temple tour, we opted to visit ‘Brihadisvara Temple’ also known as the ‘Big temple’ by the locals. 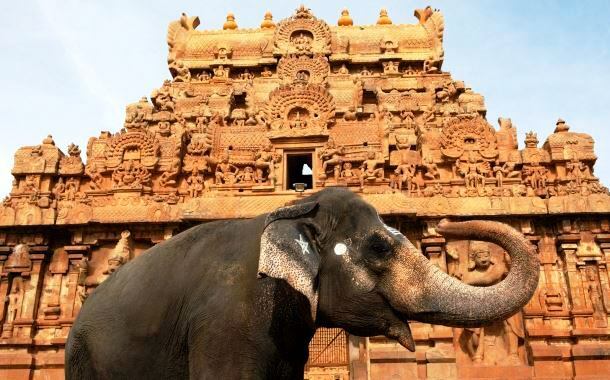 It is 40 times larger than other temples in the city of Thanjavur and surrounding region. In 2010, it completed 1000 years and is a World UNESCO site with no entrance fee or restrictions for non-Hindus. You just have to take your shoes off outside the temple and avoid taking pictures as photography is restricted in the temple! Dedicated to Lord Shiva, the amazing 216-feet tall grand ‘Gopuram’ takes you back in 1010AD. Once you are in the main temple complex, your eyes get glued to the towering central vimana of temple. It’s a hallow structure similar to Pyramids of Giza and the entire structure has been made of stones interlocked with ball and socket joint technique with no binding material used to hold the structural parts. This was nothing less than an engineering marvel considering the fact that this temple has withstood 6 recorded earthquakes and no major damage has been reported. You really have to sit down to take it all in. There are so many little details to admire and the state of conservation looked very good to me. The overall experience lifted my spirituality to the next level leaving my mind in a peaceful state. Thanjavur is nearly 300 kms from Chennai and is easily accessible by air (Tiruchirapalli airport), rail (Thanjavur Junction) and road (NH 45A). For local transportation auto rickshaws, cycle rickshaws and taxis are available. Auto-rickshaw drivers are tough nut to crack so keep dickering till the time they settle to a reasonable fare. One cannot tag Kanyakumari only for its spectacular sunrise and sunset views but also for exploring sites like Thiruvalluvar Statue (one of the biggest statues in Asia), the Kanyakumari temple, Vivekanand Rock Memorial, Udaigiri Fort and for its unique handicraft industry. Thiruvalluvar Statue is a magnificent monument that reams at you with cultural heritage and history symbolizing the greatness that stands 133 feet tall (while State of Liberty is 151 feet tall) weighting more than 7000 tons. Posing in front of a statue so tall and high was an incredible experience. I got some real good shots of the statue to show them to my friends as not many Indians are aware of this marvellous statue. 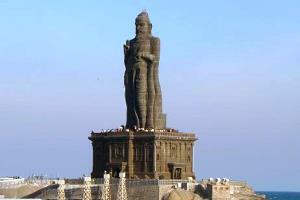 The statue is 400 meters away from the shores of Kanyakumari, easily accessible through a ferry service to the Vivekananda Rock Memorial which halts at the Thiruvalluvar Rock. The handicraft industry in the region is world famous and known for attracting shoppers from every corner of the globe. Handcrafted trinkets, seashell art, palm leaf drawings are available all over the city. Be cautions as some shopkeepers try to palm off beads as authentic coral. Being an Indian, I bargained hard and trust me, I got some best handcrafted items back home at rock-bottom prices! 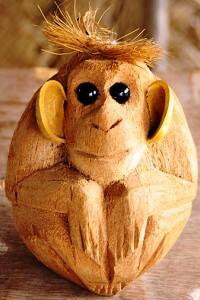 For some rural experience and uncovering the local handicraft industry, you can take a visit to any of the local villages around Kanyakumari to know the technique of making ‘Monkey dolls’ from the un-husked coconut. For more fun, try to indulge in making the handicrafts like spoons, ladles, forks, ice cream cups, pen stand or even jewellery from coconut shell or seashells. There are other attractions in the city with various myths and tales as old as the Ramayana times. For instance, according to a Hindu legend, Kanya Devi, an avatar of Parvati was to marry Siva, but he failed to show up on his wedding day, leaving the rice and other grains meant for the wedding feast uncooked and unused. As the legend goes, the uncooked grains turned into stones as time went by. Some believe that the small stones which look like rice on the shore on Kanyakumari are indeed grains of the wedding that was never solemnized. If you have never visited Kanyakumari it’s about time you checked out this serene place. Musafir Tip: Though sunrise can be viewed throughout the year, sunset is visible only from October 15 to March 15 from this southernmost tip. But one can view both sunrise and sunset throughout the year from atop a hill called Murugan Kundram which offers a panoramic view of Kanyakumari.